The VNX metaLUN feature allows Traditional LUNs (Pool LUNs cannot be used for metaLUNs) to be aggregated in order to increase the size or performance of the base LUN. 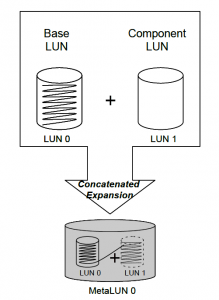 The base LUN, which can be a regular LUN or a metaLUN, is the LUN that will be expanded by the addition of other LUNs. The LUNs that make up a metaLUN are called component LUNs. A RAID Group is limited to 16 disks, and that places an upper limit on the size of a Traditional LUN, and the performance which may be achieved by a single Traditional LUN. metaLUNs allow an increase of available bandwidth or throughput, or LUN capacity, by adding hard disks. metaLUNS are functionally similar to volumes created with host volume managers, but with some important distinctions. Any Traditional LUN (or metaLUN) which is not a private LUN may be expanded.Any Traditional LUN (or metaLUN) which is not a private LUN may be expanded. This method is time-consuming and can have an impact on the performance during the metaLUN creation. 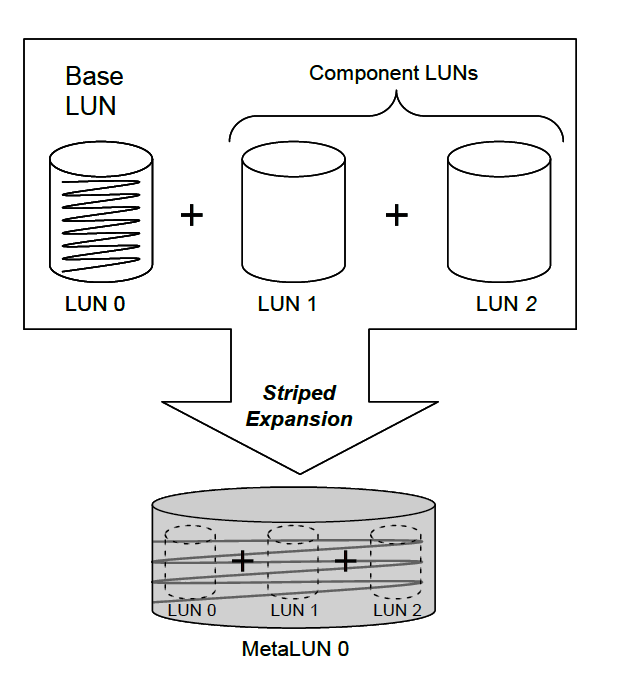 When adding extra LUN(s) to Base LUN, the data is spread across the whole stripe, meaning that data from Base LUN is partially transfered to rest of components LUN(s). Additional capacity is not available immediately – restriping takes time. 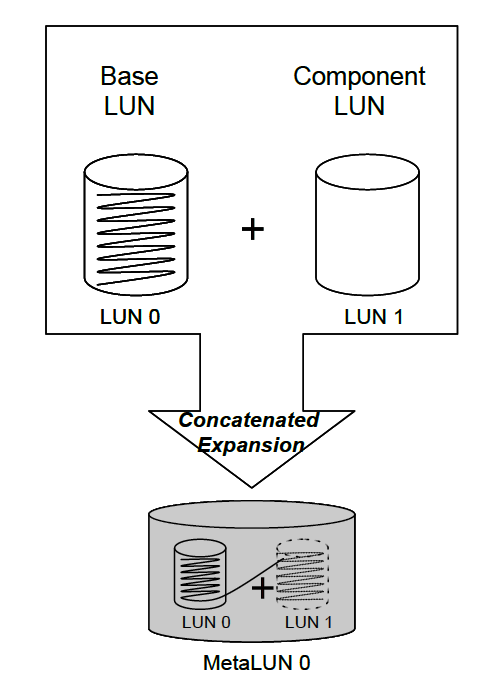 Stripped expansion required homogeneous components – meaning that base LUN and the component LUNs must all have the same LUN capacity! In addition, these LUNs ust have the same underlying RAID group RAID level and drive type. There are some restrictions though, all the components must share the same drive type. In short and to the point : support only RAID luns, same raid & same disk type for striped. I was searching form very long & found. i wana to add two different types of LUNs SSD, SAS to the same host but shown as one Disk on the OS, i know that FAST VP can do it as Heterogeneous RAID Group -if I can named like this- but my problem with vPool that i can’t limit the size of used cappacity on SSD.